There are times when an image needs to be included in a drawing. For example, a client logo that needs to be part of the title block. It would be better to convert the logo into a block object by tracing over the image in AutoCAD and applying hatching as needed. But there are some logos that are not so simple and therefore using an embedded image is preferred. If you have dragged and dropped the image into the drawing or used the OLE method, you realize that file is being referenced and therefore the separate picture file needs to be included when you send the file to the client. Select either the whole picture by using Ctrl + A or select a portion of the picture by dragging a window over the area you would like to insert into your drawing. This entry was posted in Manage, Paper Space, TIPS, XREFs. Bookmark the permalink. Thanks. Handy. One thing about your post though: The link to the original post, references this same post. Was that your intention? That is because there are a couple of sites that take my posts and post it on their own blog without a link to where it came from. The blog is full of advertising so when people look for AutoCAD content and they go the the blog that posts other people’s content and then cashes in on advertising, I at least want a link in the post so that people who visit the fraud blog can get a link to the original. What if they just delete the link? Very useful post – thank you. Good point. I did forget to mention that the default rotation of a picture will be the only rotation available once it is in the drawing. So if you need a logo to display in your drawing sideways, you will need to rotate the picture outside of AutoCAD and save the picture at that rotation and then use the steps shown in the tip to bring it into the drawing. Little thing to mention but this only works when creating a new block, you cannot insert an image into existing block as it becomes invisible outside the editor. Explode your existing block. Add image and then reblock it. If you want the block with the image to have the same name, after you explode the original block, purge your drawing of its definition. do you know how to get rid of the line around the image? I have tried IMAGEFRAME and setting it to zero (like I do for referenced images) but does not seem to work. This does not work for me. It does paste in as a very nice picture following your instructions. However, when I close the dwg file and open it back up it shows a white area where the picture was but no graphics. Try resizing the picture less than 1MB if it’s large. That works fine. When i resize it under 1MB it appears fine (not white paper anymore).But is there an option to change any variables in order to embed bigger files? Not that I’m aware of. The size of the picture in the image editor considering its pixels will determine the size that it is displayed in the drawing. My suggestion would be to somehow make it bigger in the picture editor. Did you ever find out why the picture would turn white? Same thing is happening to me and I have no clue why it could be doing that. Very Good one! Good job. Everything works fine until the end. I can’t rotate the image and it shows up as an xref that can’t be found. 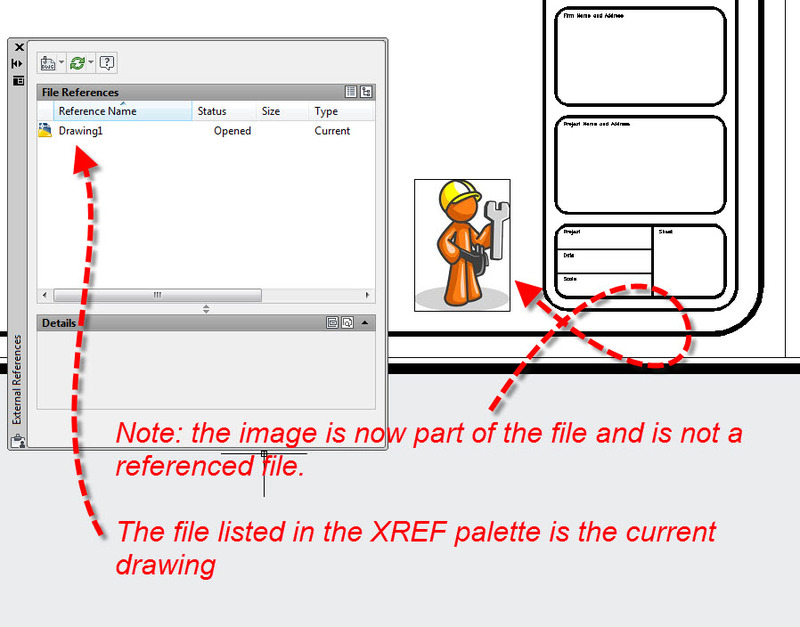 That’s correct – 1st) the whole point is that it isn’t treated as an XREF (reference) 2) The image will have to be rotated using a different program like paint or GIMP and then saved. But note that how it looks in the paint program will be how it looks in the drawing. Please somebody help me remove the frame around the ole object. Its driving me crazy. Much Appreciated!! Check out this post. A little way down is a description of the variable OLEFRAME and its available options. Once a pic is placed in the drawing with a reference to say “C” drive, is there any way to break thereerence prior to sending to someone else, leaving the pic on the drawing. I have clients sending me drawings whch come without attached JPEG’s. I could instruct them on how to place pics but want a simple solution if one exists. I think that a way to make it easy for both you and clients is to use the feature ETRANSMIT which packages the needed content of a file and places them all within a .zip file that the recipient can easily use. This has been working great (thanks!) up until this morning. When I ‘paste special’ the image now, it won’t appear after I re-open the drawing it was inserted in. I’ve tried on multiple drawings, have closed and restarted my computer a number of times, it’s just now working. Any ideas what may have happened? It worked this morning, and now it won’t work at all… a tad frustrating for a veteran ACAD user. Workaround is to edit in Paint, and re_embedd image as new OLE object, removing th eold one (if you want a copy of the previous work, save a version of the AutoCAD file before editing). 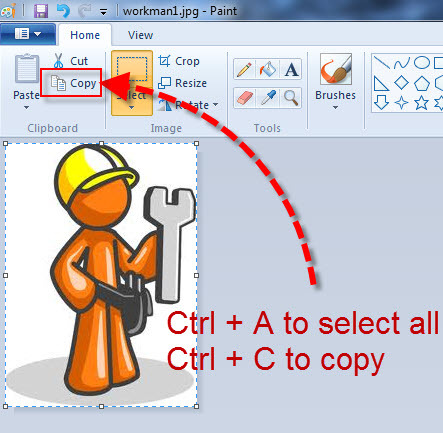 If you want to keep it simple use “Snipping Tool”. If image requires scaling find a reference of know length on original and scale in AutoCAD using a temporary dimension.. The above explanation of inserting a jpeg file works fantastic. Others in my office is not aware of this possibility. Now I have another problem. Trying to do the same thing embedding a PDF file. Is that possible?? Unfortunately no, you could save the PDF as an image (.jpeg) and then insert the converted PDF (now .jpeg) as shown in the post. Thanks Greg, I kind of figured that out and already went the path you just suggested. However, that process did increase my file size extensively. Oh well, the Contractor gets their “As-Built” Cad drawings with all xrefs and graphics binded into each drawing file rather than referenced. Job done!! Thanks. I got it (embedding a pdf) to work but it was a little more involved. When I did a Ctrl + A (to select All), it only selected the text. When I used the arrow/selection tool and windowed the whole area, I was able to do it that way. Once I had a window selected, I right‐clicked and chose “take a snapshot”. I was then able to do a “paste special” in AutoCAD and bring in the image. Even with an area windowed, doing a Ctrl+C only got me text. Dear Greg, I’m a new comer from Indonesia, and would like to joint with this blog. However, thank you in advance for your help. Regardless of the viewport Shade Plot setting – Slect the OLE object and then right click click “Properties” to open the “Properties” Palette. Thank you for your prompt reply. hello, I’m embedding the image as described and when i copy the image again with the DWG or try to scale i keep getting a empty white box. the only way to avoid this, is to reduce the size of the embedded file before you insert it. Autodesk claims its a hardware limitation issue! Hello thank you so much for the tip, just 1 question is there a way we can clip the picture while in autocad , the same way we used to clip it if attached as xref. Unfortunately no – any adjustments to the picture Like “clipping” or even rotating to a pic that it is embedded in the dwg need to be done in the editor prior to pasting it into AutoCAD. It’s kind of a clunky method (I know) but after a few tries you’ll get it how you want it to be. Thanks for your support and I used most your video clips and it works fine. I suggest that you try using the OVERKILL command, as well as PURGE and AUDIT. Then save the drawing and see what the size is. What size is the picture that you are embedding by itself outside of AutoCAD? Thank you for the tips. Purge I’ve tried before on the drawing and it made no difference. The Overkill and Audit didn’t help much either. There was some errors, but nothing significant. The drawing size is still about 5.7MB with the embedded picture. I’ve copied and pasted the whole drawing into a new drawing, ran purge, overkill and audit and it took the original drawing from 160KB to 150KB, but when embedding the picture, took it back up to 5.7MB. Not sure if this will make a difference,but when I import the picture as a reference, the size remains as is eg, 659KB in AutoCad. Also, an earlier typo, its actually AutoCad 2013 and not 2015. If all else fails, I will send the picture with the drawing. Just not sure as why its giving me problems now and in the past it worked fine? Once it is embedded in the drawing you can’t scale it. You will have to do that outside of AutoCAD first and then bring it in to your drawing. I am glad that you found it helpful. But to answer your question: You have to adjust the scale & rotation of the image outside of AutoCAD first and then embed the image. It might take a few tries to get it right but once you do get it right, it is worth it. This does not work for me. I follow all the steps, but when I Paste Special, the box comes up to say “unknown source” and I get only Unicode Text, Text or OEM Text for the options. Would this be because I’m actually trying to insert a photo jpeg? But it is not possible to rotate or align ? Unfortunately no. any adjustment of the picture has to be done prior to bring it into AutoCAD. Thank you for the good tip. My company’s logo has a bright blue but when I paste it into AutoCAD this blue becomes darker. Is there a away of resolving this without playing around with paint. not that I know of. I would consider taking the time of tracing the logo in AutoCAD and making an AutoCAD block so that it prints as desired and is able to be tweaked on how it is printed by the .ctb file. I know that it may sound like a lot of work but you will have a vectorized and controllable logo. Thanks for your quick response. I will try. Sir thank you for you help but when i attached the image as you tech all are fine but after save the file and close and reopen the same file the ole object are not showing i think it removed my drawing so please help me. When I use paintbrush to copy a logo into a dwg and I convered it to a pdf (with Acrobat Adobe X pro) the colour changes. Can you help me with this problem? May I put my 5cents worth – when the image is inserted as you describe, scaling is not a problem if you block it then reinsert the block at the scale you want. Also the boundary can be removed by creating a new layer called “image” say, and make it’s colour white, then change the image to that layer. The border disappears but not the image. You can play with ‘send to back’ and ‘bring to front’ commands also, in overlap situations. I operate in a white background by the way. A good blog. Hi, Thanks for the above sharing. I did follow the edit images from paint. But when I insert the title block, rotate my title block the logo is not rotated. Any solution? Hope to get help from you. When the image is embedded in the drawing, it isn’t editable like that. I think that all that you are able to do is move it. try rotating the picture in Microsoft Paint and the copy & paste. Awesome post! quick easy and to the point! How can I paste image in a rotated cad file? I am not been able to paste it directly. Is there any way not to use link image. Can u help me to create a new hatch? Hi everybody!! Is there a Lisp based in your tip? thanks! I followed this process above but the image does not print and is not saved when I save the file? Anyone have any experience here? Thank you very much sir! i am trying to resize a picture in Autocad, but its width and length move at the same time I want to expand the height and the length should not be changed, if any one can help me. Any way to do this on Autocad for Mac? Hi, Pasting in is fine. Save the drawing then open it up and the image is gone. Any ideas? Using AutoCad 2017 this is impossible. PasteSpec only allows types of text. does including a copy along with the DWG work either. Honestly AutoCad has not kept up with real world technology whatsoever. There are much better graphics tools “out there” for this field of work. Hi, I am now using AutoCAD 2017. 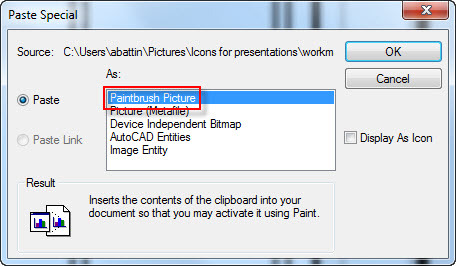 I followed all the steps but when I’m about to use the PASTESPEC command, somehow the Paintbrush Picture option on the window is not available. I used all other options but still, the image file is not attached/ bound as an independent file.